This year’s Memorial Day takes place on Sunday 27th January, and in Germany this weekend clubs and football fans will join thousands around the world by dedicating a matchday across all leagues to mark the occasion. Using the motto Nie Wieder! (“Never again!”) games in the Bundesliga, 3. Liga and Allianz Frauen-Bundesliga (women’s Bundesliga) will commemorate the day by remembering victims of the Nazi regime in stadiums nationwide. Film screenings, panel discussions, visits to memorial sites and fan magazine publications are among the many activities organised in Germany as part of the Nie Wieder! initiative. In Frankfurt, a “Remembering is not enough” DFB panel event took place earlier this month with a panel discussion held to remember the Holocaust under the motto ‘Never Again’. The event was attended by DFB president Reinhard Grindel and former German international Cacau, among other guests. In Osnabrück, a fan project will remember the victims of National Socialism, with a discussion asking what influence the National Socialists in Osnabrück had on football clubs and players. Ahead of the home game against SV Meppen fans of VfL Osnabrück will also show solidarity in the fight against racism and discrimination by holding up banners. A fan magazine has also been published and will be distributed at the stadium. On Saturday in Munich several places of remembrance have been set up with the aim of raising awareness. Maximilianstraße (Kammerspiele), Theatinerstraße 35, Stiglmaierplatz (Löwenbräukeller) and Bayerstraße 27 will all host memorials, while a further memorial will take place in front of the Allianz Arena stadium ahead of FC Bayern Munich’s game against VfB Stuttgart, open to all visitors. 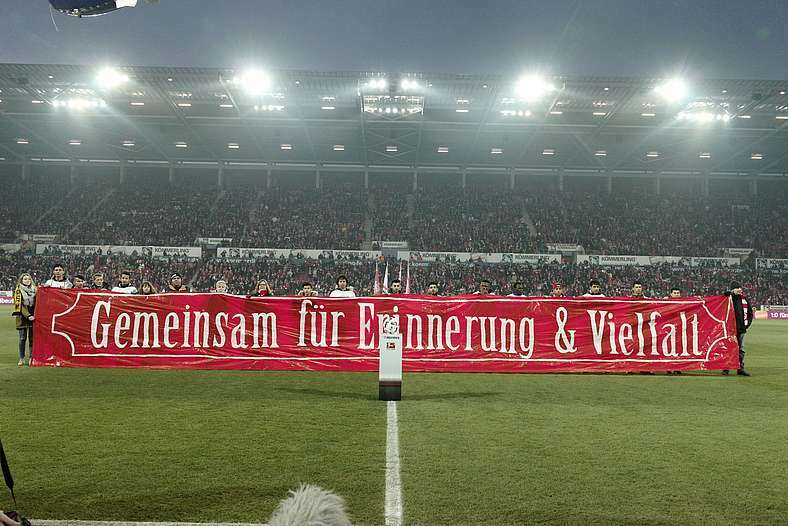 In Mainz, club officials of Bundesliga outfit Mainz 05 and FC Nürnberg will mark the occasion by recalling the victims of the Third Reich, and the resulting need to resolutely oppose racism, anti-Semitism and xenophobia in football and society. The weekend around January 27, the anniversary of the liberation of the Auschwitz-Birkenau extermination camp, has been used for more than 15 years now by German football and the Nie Wieder! campaign to promote a continued culture of remembrance and mark the fight against right-wing ideology in stadiums throughout Germany. In England, Premier League club Chelsea FC are one of many clubs planning to mark the occasion. The club’s owner, Roman Abramovich, and leading players have launched a video and social media campaign to raise awareness of the Holocaust, under the slogan “We Remember”. The campaign is running in conjunction with the World Jewish Congress.